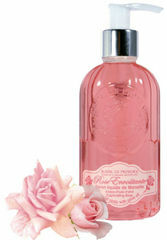 This Jeanne en Provence Captivating Rose liquid soap of Marseille is made using the traditional Marseille method. Contains 100% vegetable olive oil. This soap cleans your hands gently and gives you a delicate sensation of well-being. Paraben free. Products not tested on animals, no animal fat. Jeanne en Provence, products full of emotion.